It’s fall, the weather is changing and you never know just what might crawl out of a cave and eat you! Just kidding, no worries here, Theodore the dragon is not hungry. He is not interested in eating a bird, or a wolf, or a tiger, or any other creature that passes his cave…but he might be convinced to gobble up a boy who comes into his cave and pokes him in the nose with his sword. Luckily for the boy, he is quite amusing and fun and this makes Theodore want to play with him instead. The illustrations are clever and dark until, with a turn of the page, you experience a huge flash of color as Theodore exits his cave. This makes the book even more exciting. Warning: Do Not Open This Book! 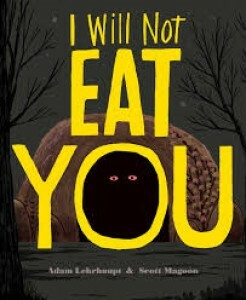 was also written by Adam Lehrhaupt which is one of my favorite read alouds (also featured as a CHP Book of the Month). Enjoy!